A question commonly asked in the industry is “how companies are incentivizing their employees to become Control Account Managers (CAMs)”. Before answering this question, it is important to fully understand what the CAM’s roles and responsibilities are. In addition, it is important to understand the what authority and accountability a CAM has within his/her organization. Establish and maintain Control Account budgets and schedules. Define the tasks and the sequencing of the schedule for optimizing the accomplishment of the work scope. Assure the scheduled activities for the Control Account have a realistic duration and performance logic. Maintain the appropriate portions of the WBS Dictionary and approve the Control Account Authorization (CAA) and authorized changes to the CAA. Proactively manage the personnel performing the Control Account detailed scope of work. Identify, negotiate and implement required vertical and horizontal interfaces. Manage Customer Expectation Agreements (CEA) and Memorandums of Understanding (MOU) with other organizations and programs. Review and approve all resources and cost type charging to the Control Account and assure its accuracy. Monitor and assess preponderance of Control Account and Work Directive. Prepare Control Account Variance Analysis Reports that clearly address cause, impact and corrective action. Develop, implement and manage corrective actions, as applicable. Maintain an awareness of the Subcontract Data Requirement List (SDRL) items and other applicable contract deliverables. Prepare Estimates to Completion for remaining Control Account work scope. Provide forecast dates for accomplishing activities and milestones in the Control Account Schedule. Evaluate applicable Critical Path tasks within the Control Account. Manage the integration and monitor the development of any critical technologies. Inform management of significant problems concerning Control Account performance. Identify potential technical and programmatic risks and make effective use of the risk management tool. Employ the baseline change control process for any revisions to the Control Account’s baseline scope, schedule and budget. Submit Budget Change Notices (BCN) as necessary. Proactively manage all subcontractor effort that affects Control Account performance. Lead or participate in Make/Buy decisions. Evaluate alternatives and develop facility utilization plans as applicable. Status all work scheduled within the Control Account. Participate in applicable IPT meetings to assure technical integration. Update the CAM Notebook to maintain currency and accuracy. In addition, the CAM has the authority to review and approve all work assignments, documents and commitments involving his/her Control Account. This results in the CAM being held fully accountable to the Program Manager for overall Control Account performance. Below are some specific items a CAM would have authority over. In addition, a list of accountable actions is provided. Approve the Control Account Authorization documents. Co-approve the Make/Buy Plan for any material used in the performance of the Control Account scope of work. Approve Control Account Budget Change Notices and Requests. Authorize and coordinate work performed by functional departments on Work Directives within the Control Account. Determine the work schedule and prioritize work within each Work Directives issued for the Control Account. Approve hours charged to the Work Directives supporting the Control Account. Approve material and other direct costs charged to the Work Directives supporting the Control Account. Identify potential technical, schedule and cost risks and enter them into the Risk Management Process. Complete the Control Account scope of work within the schedule period authorized. Complete the Control Account scope of work within the resources authorized. Achieve the technical performance goals for the defined scope of work. Assure that the reported Earned Value performance is based on quantified back-up data including justification of variances, identified impacts and corrective action plans. Mitigate all technical, schedule and cost risks associated with the Control Account. Companies will reward individuals with a ~$5k bonus for passing all the requirements in becoming a CAM. In many cases, this encourages individuals to better understand the cost and schedule aspects of the job in order to become an effective and successful CAM. They will be required to take an instructor led class of 3 days for basics of Scheduling, 3-day basics of EVMS, then 3-day Advanced course where both cost and schedule are covered. Then and only then can a title can change from Control Account Leader (CAL) to Control Account Manager (CAM). Increased Upper Management support and emphasis on the CAM’s role motivates individuals in becoming a CAM. In one example company, the Vice President of Programs required potential CAMs to prepare a presentation proving what they had learned during the CAM Certification/Training process. Having upper management buy-in on the importance of the CAM’s role is crucial. Organizations will use the CAM position as a stepping stone/pre-requisite toward becoming a Program Manager (PM). This can be an effective technique. Assurance that the CAMs will have the appropriate Cost and Schedule support staff assisting them as required. CAMs cannot be expected to be the expert in the Technical, Cost and Schedule disciplines on their own. Qualified Cost/Schedule support is essential to properly managing the CAM’s role. Any or combination of the above examples can increase the desire of individuals into becoming CAMs. Management positions are not for everyone. Often individuals who are otherwise highly proficient in their existing positions fail as managers. The CAM role is no different. It important for organizations to fully define the roles and responsibilities of the CAM as well as the incentives and goals used. By doing so, organizations will be better equipped in placing the right individuals into CAM positions for success. Thank you very much for this informative post. My question: A control account can often be compared to a subproject. 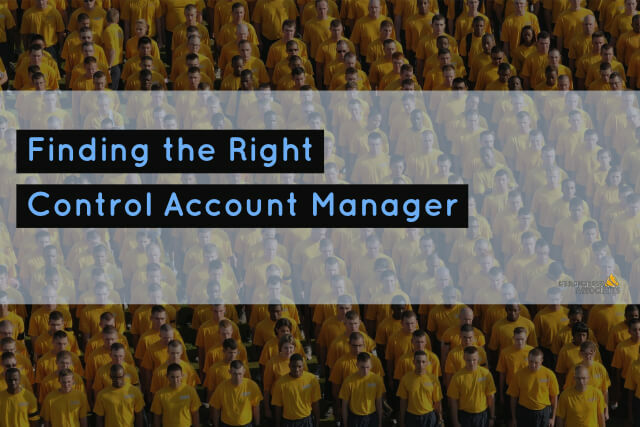 I thought the control account manager could also be the subproject manager. But in your article I can’t read that the control account manager has the responsiblity to lead a subproject team. Are this often different roles? I hope you can give me more detail about this point. Thanks a lot.